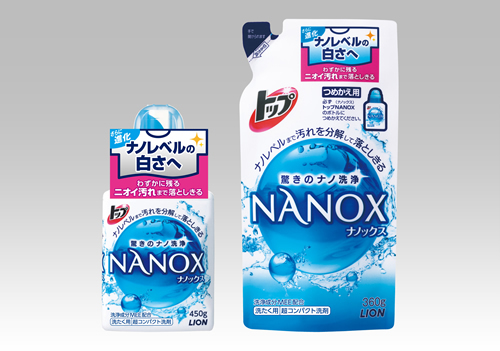 Lion Corporation (President: Itsuo Hama) announces the nationwide release of improved TOP NANOX on Wednesday, March 6, 2013. This super-concentrated liquid laundry detergent effectively removes grime and sources of odor that penetrate deep, even into the complex fiber structures of functional fabrics. This is made possible by the use of proprietary Lion ingredients, including high-detergency MEE2 and an ER (“Easy Release”) detergency enhancer, which the Company newly added to NANOX to enhance the nano-washing power of MEE. Recently, the market has seen an influx of a variety of functional clothing, such as thermal and quick-dry underwear. Many of the functional fabrics used in such clothing are combinations of several kinds of artificial fibers. Due to their complex fiber structure, such fabrics tend to attract oily substances, such as sebum, that often remain embedded in the fabric even after washing. Meanwhile, the amount of water used per load of laundry has declined while the size of the average load has increased, reflecting growing pressure to conserve water and an increase in the number of single-person households who prefer to do their laundry all at once in the weekend. These two factors make it more difficult to completely remove grime when machine washing. In particular, an increasing proportion of people are dissatisfied with the cleanliness, or brightness, of laundry after washing (45% in 2008 compared with 50% in 2012 according to Lion surveys). Lion’s super-concentrated liquid laundry detergent TOP NANOX, released in 2010, has been highly rated by consumers for its nano-washing quality. It uses the plant-based washing ingredient MEE, which decomposes such sources of odor as the oleic acid contained in sebum into nano-sized3 particles, thereby removing the grime attached to fiber. Lion is now releasing an improved product that incorporates a new ER detergency enhancer, which bolsters the product’s nano-washing power to help remove sources of odor and prevent future staining. The new TOP NANOX effectively removes grime from a wide range of fabrics, including both cotton and artificial fibers and restores original brightness. By adding an ER detergency enhancer, a kind of polymer, TOP NANOX prevents staining from repeated washing by dislodging grime entrenched deep in the complex fiber structure and effectively removing it. Applying its proprietary blending technology, Lion has successfully improved the ability of the detergent to decompose odor-causing sebum and oleic acid, which tend to remain even after washing, into nano-sized particles. It thus allows the sources of odor to be effectively washed out of functional fabrics made of artificial fiber. By adding a dent to the original dome-shaped cap, ease of use is improved for those with weaker grips. The product’s improved detergency is highlighted by featuring the phrase “Nano-level Brightness” on labels and other kinds of tags. Thanks to the blending of the high-detergency ingredient MEE into a highly-concentrated formula, TOP NANOX displays high detergency, requiring that the volume used be only half that needed when using one of Lion’s conventional liquid laundry detergents. Due to its excellent defoaming property, detergent residue can be removed with only one rinse cycle, helping users save water and cut power usage.